Church View Cottage01263 715779work01603 870304fax Self-cateringThis wonderful cottage is more than meets the eye, enjoying a delightful character through its traditional beams, pamment floors and pretty garden. With a lovely view of a church, this property is surrounded by picturesque countryside. There are a number of great beaches for guests to visit and coastal paths and walks to explore. This property is perfect for couples wishing to spend a holiday relaxing in a beautiful and tranquil environment. 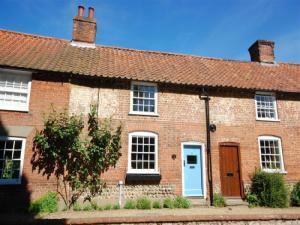 Church View Cottage is located opposite the church and enjoys a pretty village setting. This wonderful cottage is more than meets the eye, enjoying a delightful character through its traditional beams, pamment floors and pretty garden. With a lovely view of a church, this property is surrounded by picturesque countryside. There are a number of great beaches for guests to visit and coastal paths and walks to explore. This property is perfect for couples wishing to spend a holiday relaxing in a beautiful and tranquil environment. From Fakenham take the A148. Turn left to Great Snoring. Enter village, go over bridge. No 3 The Terrace is opposite the church. From King's Lynn - 20 miles Taxi from King's Lynn or bus to Fakenham then taxi.